Gregory Price Grieve is Professor and Head of the Department of Religious Studies at the University of North Carolina at Greensboro. Grieve researches and teaches at the intersection of Asian religions and popular culture. He specializes in digital religion, particularly the emerging field of religion and video games, and his current research uses video games to explore the category of evil in contemporary life. 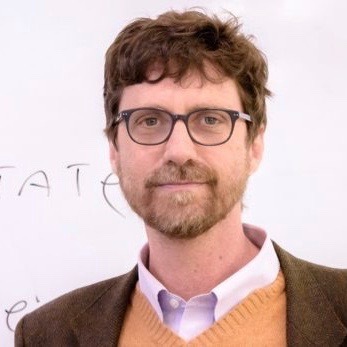 Gregory Grieve will write the book, Video Games and the Problem of Evil, which explores the role that “evil” plays in video games and focuses on how video games’ immersion reshapes identity, community, and our understanding of human relationships. By constituting a new model for public theology, Video Games and the Problem of Evil addresses the central role of technology and ethics in contemporary life. Grieve illustrates that video games can operate as vernacular theodicies through which players, as moral agents, ethically engage the problem of evil. Broadly speaking, theodicies attempt to work out the problem of evil in the world. Vernacular theodicies are diverse everyday media practices, which are entrenched in popular culture, rather than in the official “high” culture. Grieve demonstrates how video games differ from the menagerie of other digital media, from Facebook to the Internet of Things, because, by immersing players both in digital mediated game-worlds and game communities they highlight how people are and are not present to each other. Video games differ from other media such as film and printed literature, because they do not merely represent evil as an audio/visual layer, or tell about evil as narrative, but simulate immersive worlds in which players dwell. Because of such immersion, video games reveal the ways in which digital technologies reshape human relationships. As a cultural scientist, Grieve seeks to understand the role of video games in relation to the contemporary practice of religion, particularly ethics. Analyzing the concept of evil in gaming is significant for understanding contemporary changes in ethics, because it reveals the media practices that make gaming meaningful, and thus the ethical labor that digital games perform in contemporary society. In particular, the conceptualization of evil shows that ethics underpins much of gaming, and reveals how agency and subjectivity are shaped, distributed, and negotiated in gaming and its larger social contexts. Scholars of video games and theology are in a prime position to speak both descriptively and normatively. Has ethics reached the end of the line? Does digital media usher in the demise of morality and a new era that has replaced duty and responsibility with the singularity of pure aesthetics? Video Games and the Problem of Evil suggests that games can give us hope. What if we decided to use everything we know about digital gaming to address this ethical crisis? What if gaming proves to represent a new dawning, rather than the twilight, for ethics, and reveals that ethics has lost none of its topicality, and simply needs to be seen and dealt with in a new way?